Forget staying put in a hotel or homestay the next time you are in Pondicherry, because houseboats are a thing now. Mantra House Boats is your answer to staying on a floating accommodation and exploring the backwaters of Pondicherry. If a cruise along the backwaters of Pondicherry is on your bucket list, then living in a houseboat is basically ‘two birds, one stone’ scenario. You get to enjoy life in a houseboat while floating through the cool, blue backwaters. Perfect for weekend getaways with bae or the squad, the houseboat comes with spacious living rooms, attached baths, kitchen, and other amenities. There’s even a three-member crew that comprises a chef who specialises in local seafood dishes as well as continental cuisines. Something for everyone’s palette, we say. Oh, and the houseboat’s spacious living room is a hub for activities and lounging around. An open air space, there’s plenty for you to enjoy in terms of view as you cruise through the backwaters during the houseboat tour. When the houseboat’s docked at the pier there’s plenty of sights to check around Pondicherry starting with the Sri Aurobindo Ashram or Auroville. If it’s your first time to Pondy, then a trip to Paradise or Serenity beach is highly recommended as well. For folks who’ve already familiar with the place, a revisit to Romain Rolland Library or the Seaside Promenade looks good on the cards, right? 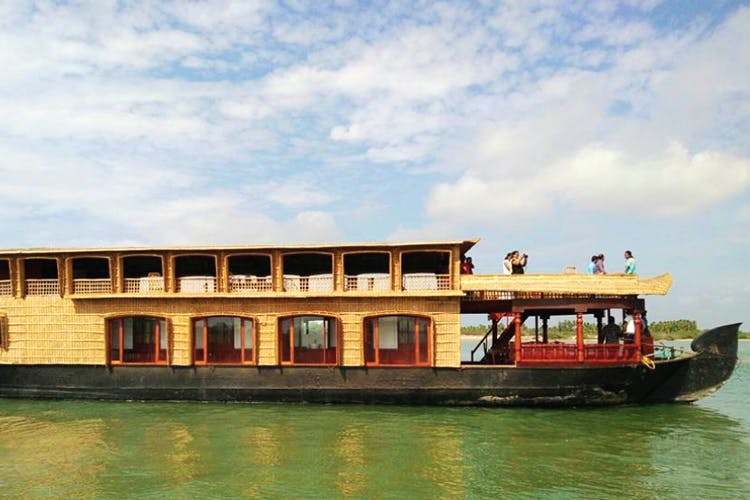 The houseboat experience can be booked off for INR 7,000 per couple for a single room or if you are coming with your gang, then you can book the entire boats for INR 16,000 for a group of six people. The rates are inclusive of welcome drinks, breakfast, lunch, and dinner.